Pascoe International design and build the world’s only range of tenders produced to full super yacht standard, that are truly able to represent the quality and attention to detail of the mother ship. When we were asked to review the brand we found it needed a shot of pure luxury and high design injected into it. 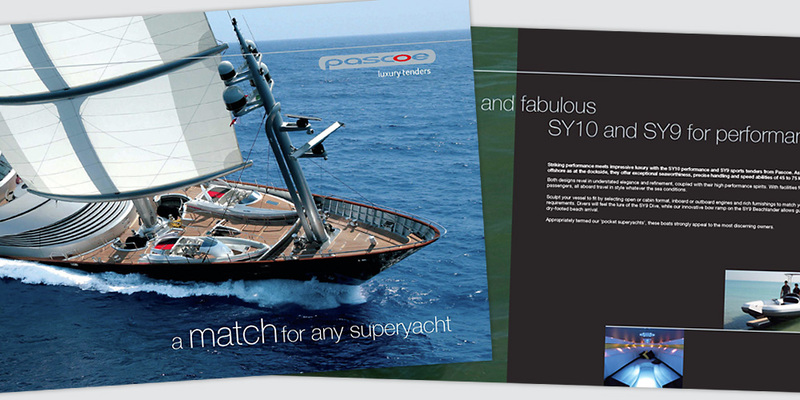 We took a stance that differentiated Pascoe in the tender market and aligned them with the superyacht industry itself. We produced Pascoe’s creative strategy and implemented it across brochure, corporate literature and website with a tailored CMS. Always looking for ways to make budgets go further and impact to be greater, we designed a Monaco Yacht Show stand which, with market insights, stole a march on Pascoe International’s competitors simply by being black amongst a sea of white – simple, smart and very effective.